In 2017, CLP granted a Future Conservationist Award to Ravinder Kaur and her team to help improve breeding opportunities for Malaysian hornbills. Here, Ravinder describes the team's recent activities and observations of hornbills testing in artificial nest boxes. Rhinoceros hornbills are vibrant birds that are found in the tropical rainforests of Southeast Asia. They are categorised as Near Threatened on the IUCN Red List of Threatened Species. When in pairs, they have a peculiar habit of engaging in a duet call, with the male calling out in a short note ‘hok’ while the female responds with a short ‘hak’. Together they celebrate their monogamous relationship through their song, ‘hok, hak, hok, hak, hok, hak…’. These birds nest in tree cavities and yet, despite their large bill and casque (the helmet-like structure that sits on their bill) they are unable to create tree cavities themselves. 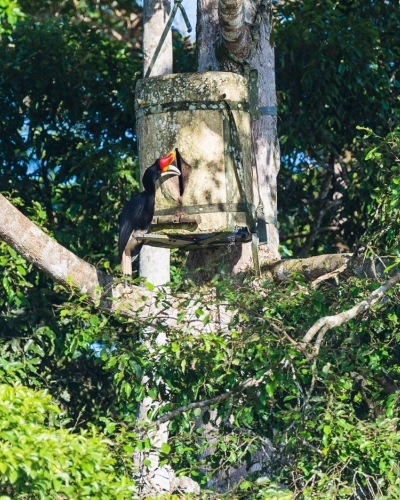 The species relies on other animals such as woodpeckers and sun bears to create cavities, which the hornbills later occupy. Many large cavity-bearing trees in the region have been removed as a result of logging and agricultural expansion. For example, Kinabatangan (Malaysian Borneo) is a regenerating forest that is home to eight species of hornbills. The forest is rich with fig trees but lacks cavity-bearing trees. To address this issue, in September 2013, the local conservation organisation HUTAN/KOCP, with the support of Chester Zoo and Beauval Zoo, ran a pilot project to set up five artificial nest boxes in the forest to test whether large-bodied hornbills would use them. The boxes were visited by four species of hornbill: rhinoceros, Oriental pied, wrinkled, and bushy-crested hornbills. Only the smaller-bodied Oriental pied hornbills made nesting attempts. 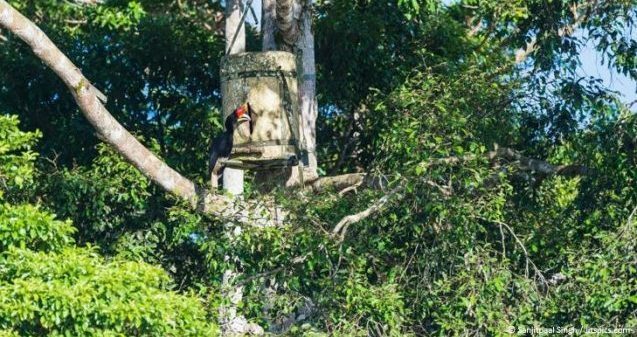 In 2016, a pair of rhinoceros hornbills began to show interest in one of the nest boxes, and they attempted to seal the nest entrance, a sign that they were planning to reproduce. In July 2017, what seems to be the same pair of rhinoceros hornbills nested in the box and managed to successfully raise a chick until it fledged. This represents the first ever wild pair of rhinoceros hornbills to nest in an artificial nest box! 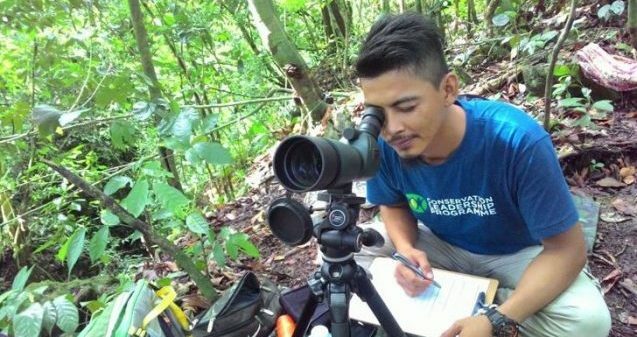 In April 2017, CLP awarded project funding to a team of early-career researchers in Malaysia to carry out the project “The Conservation of Bornean Hornbills in Malaysia”. The use of an artificial nest box in Kinabatangan marked the beginning for the CLP project team because it strengthened the belief that, indeed, there is a shortage of suitable nest cavities for large-bodied hornbills. However, the fact that the five boxes remained unoccupied for several years and were used by only one type of large-bodied species is an indicator that the design of the artificial nest boxes requires more thought and further improvement. With CLP funding, the team will enhance the design of the artificial nest boxes. In order to provide better boxes, the team is conducting systematic nest searches in the forest to locate hornbill nests. This year, the team managed to locate three new nest cavities belonging to black and Oriental pied hornbills. These natural cavities and their internal microclimate conditions will be studied using data loggers. The knowledge gained will be applied to the development of the new batch of artificial nest boxes. 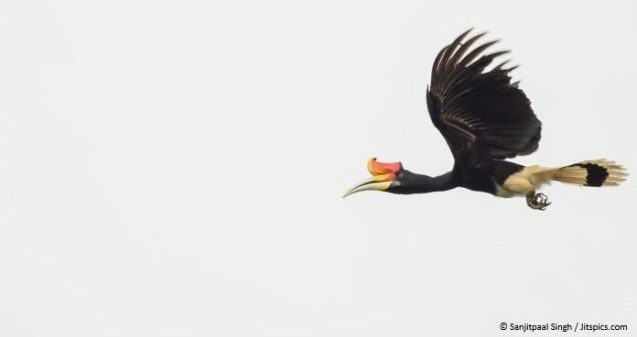 The team hopes that the new boxes will encourage more individuals to nest, such as the Near Threatened wrinkled hornbill and the Critically Endangered helmeted hornbill. In addition, the nest boxes could be an important addition to ex situ breeding programmes in zoos. This project is also supported by the Malaysian government, University Malaya (Fundamental Research Grant Scheme), Sabah Wildlife Department and Sabah Forestry Department. It is also supported internationally by Ideawild, Chester Zoo, Phoenix Zoo, Beauval Zoo and Houston Zoo.